Day 2: Success comes from Talent, Preparation and Execution. I’m going to launch into a discussion and definition of the three terms that I think are most important to improvement: Talent, Preparation and Execution. Talent is the list of things that you can do that matter in your sport. If you can throw a forehand a maximum of 35 yards, then that is the extent of your talent in that particular area. If you can jump off of your left foot and catch at a peak of 9.5 feet high, then that is your talent level. A player that can catch the disc at a peak of 11 feet high is more talented than you in this particular part of the game. Parts of your talent are almost always a mixture of physical and mental aspects. Talent can be ‘God-given’ in that you didn’t consciously work for it, but it can also be developed intentionally. Most likely, many of your talents are a mix of both. For example, the ability to defend Sam C-K tightly for 10 straight cuts is a talent. It’s a rare one, at that. It requires a combination of speed and endurance, anticipation, and footwork. You need to know and instinctively be able to react to the movement of the disc while changing your position and vision on the field at high speed. Simultaneously, you need the endurance and mentality to ignore the inevitable signals from your muscles that you are approaching the end of your energy. Recognitions and reactions to situations can also be talent. Some people are naturally talented at making quick angle decisions while marking. Some throwers have special talents for recognizing a defensive scheme calmly. Again, the combination of mental and physical abilities that combine to define your talent. In the same way, perception is a learned talent. The ability to read the field as a thrower can be improved. An expert thrower doesn’t just do different things with the same information, they actually see a different field than you do. We know that this is true from studies on chess experts, and years of anecdotal evidence suggest that the best athletes really do experience a slower, crisper reality in the madness of a point. Sometimes I’ll use the word “skill” to indicate a talent that you can easily see, and “perception” to indicate a talent that is purely mental (thanks for Josh Greenough for the insight). I’m making an intentional distinction here. “Cardiovascular endurance” is not, by my definition, a talent. It may be a necessary building block, but it is not in itself a talent in the realm of Ultimate. That difference is crucial. If you are just building strength by deadlifting, you are definitely building strength. However, you are not building a talent until you build a tool that you can use during a game. If you already have the other building blocks required for defending C-K then it is possible that the physical work of improving your endurance or strength is the missing piece. Unless you have those parts, however, building physical capacity by itself is unlikely to pay off. This can be hard to appreciate, especially since it is easy to find examples of players that appear to be improving their physical endurance and having this lead to direct improvement on the field. I am not denying that this is possible, but only that the value gained is limited. To improve at your best possible rate, physical abilities need to be cultured in a game-specific way. The talent of a team is essentially the collective talent of the group. This talent doesn’t tell us what the team does do, because talent is what the team could do. Talent is a measure of the best your team could possibly play. If your team has ten players that can cover a pull like Skip Sewell, that is a talent. If you know, collectively, how to run a clam defense until a 3-throw transition, that is also a talent. For most of us, what we need to know is that team talent is a sum of individual talents. There are two exceptions to this first approximation of team talent as a sum. First, the downside: For some skills or perceptions, overlapping team talents can be less useful. For example, having 3 great pullers is excellent. 20 great pullers? Not much more useful, and so some of that individual talent doesn’t translate into team talent. How many pullers does one team need? Your team talent is the total potential for your teammates, assuming that they have everything they need to succeed. The second exception is positive: There are some players that have a talent for helping to bring out the best qualities in their teammates. They aren’t improving the talent of those around them, which would be as strange as walking onto the field and suddenly causing all of your teammates to be 2 inches taller. But they do have a talent for improving the performance or execution of those around them. They might make their teammates feel 2 inches taller just by taking the field. We’ll explore this particular talent for inspiring or facilitating confidence a bit later. Above all, talent is limited. Talent does not win games, and players are not judged by talent. Just because you can throw a hammer for 55 yards doesn’t mean that you throw it well, or that you throw it well when it matters. To really understand the importance of talent in games, we need to understand both preparation and execution. Preparation is the process of maximizing the consistency and reliability of your talent. 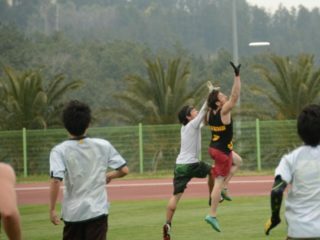 I assume that every player on your team can catch a disc one-handed while running. That skill is nearly universal. Preparation is the practice that you do to ensure that your players complete that catch 99 out of 100 times. Or that you make it 8 out of 10, when two weeks ago you only made it 7 out of 10. Fundamental skills like catching are typically not limited by talent. Everyone can do them at some level, and the reliability is crucial. Especially in Ultimate, where each one of those drops is a potential goal for the other team, you need great preparation to use your talents to their fullest. Decision-making is a result of preparation. If a player is choosing between a blade and a reset throw, then the ability to make that decision (the talent, or more specifically, the perception) is taken for granted. When you can do both things, what do you do? Habits like this make or break many players. If you are repeatedly throwing backwards resets in high wind zone offense (when you should probably be aggressively taking shots downfield) then your preparation has let you down. You are fully capable of making the right decision, but you don’t. Team decision-making goes one step further. For most of us, it is enough to assume that team leaders are preaching the right kinds of decisions to make. An example of this is that you should dump the disc at high stall counts. It makes sense, and the understanding is that as long as you go along with the team decision-making scheme that you will succeed. For team leaders, the correctness of those decisions is also a necessary part of preparation. Teams that have players that don’t stick to the game plan will suffer as long as the decision-making game plan is right for the situation. If your team can’t stick to the plan, or you do not have the team preparation for constructing a useful plan, then you will suffer no matter how high your level of team talent. And you will lose to teams that have great preparation. I can’t tell you how many times I have heard players on mediocre teams tell me that their offense is not the problem because they can run both vertical and horizontal stack schemes. This is confusing talent (the ability to possibly run a particular offense) with preparation (the consistency of the motions and decisions needed to run the offense reliably). The word proficiency works well for me here (thanks to Gwen Ambler for the suggestion). Proficiency includes a measure of reliability added onto ability. Very few teams are held back by a lack of diversity of known team strategies. At the same time, there are very few teams that have great proficiency on offense and defense. Preparation is huge. If you have players that can motivate their teammates to practice well, your team has a huge advantage. Similarly, if you can push yourself to practice and train at high speed and effort levels then you will be better prepared. You might not ever cut hard, but if you can always cut at the extent of your potential then you are the rare reliable cutter that many teams need. I’ve seen T-shirts extolling the wisdom that “Hard work beats talent when talent doesn’t work hard”. Talent that doesn’t work hard is inconsistent and unreliable, and vulnerable to less talented players that are those things. Developing roles on a team is preparation. Interacting well with your teammates is preparation from the team perspective. Being ready and rested at game time is preparation. If it is true that “showing up is half the battle”, then players that habitually prepare well have a 50% advantage over the rest of the players in a game. If I had to write this entire section in one sentence, it would be this: Don’t confuse “can” with “does”. You know that “can” player by the intimidating array of talents in warm ups, and the mysterious way they seem to not translate into a major part of the team. You find yourself saying, “If he just did X every time, he’d be unstoppable”. But he doesn’t, even when it is clear to him that he should. If you can transform ‘can’ into ‘does’ then you have the makings of a great coach that can build players or build teammates or even build yourself. You can prepare yourself to do almost anything within your talent. However, there is no way to completely prepare for the unique challenge of a big game. Execution is the ability to perform when it matters. Pressure affects everybody, but it seems to generally affect the people that care more. As a committed athlete, you are already trapped: you care, and you know you care. You care about your teammates and you care about the outcome of the game. That helped you to develop your talent and drove your preparation, but it hurts you when you are on the stage. There is a very real set of responses that are common to great stress, such as tunnel vision, loss of senses, errors in using those senses correctly, and lack of physical or emotional control. These effects are real, and are not limited to the inexperienced. They can combine to make actions, even actions that you’ve practiced many times, extremely difficult. They’ll start to require large amounts of attention and energy, when your attention and energy really should be pointed towards your teammates and opponents. Execution is more often reflected in emotions and team dynamics than preparation and talent. Players that have great execution use the most possible amount of their talent and preparation against the opponent. They don’t fight themselves. Teams do the same thing. Teams that execute well work in sync, and they work in a common direction. If your team practices diligently and has team talent, it might still be held back by players that argue on the field or on the sidelines. Your opponents don’t just stand there and watch it happen: they feed on that. If they are any good, they get more excited and bring more energy in the face of your weakness. Your team has fallen in the face of pressure; often this looks like a player screaming at themselves for a mistake or arguing about the cut that their receiver should have made. For all of your talent and preparation the team is lacking in execution. On the other hand, if your team can stay loose and even playful then you are in a position to maximize your execution. Do teams have fun because they are winning, or do they win because they have special personalities that make them have fun? I see both causes every year. When I am selecting a team, I put a priority on players that can play their best while smiling (Chelsea Dengler, Aly Lenon, Doug Mckenzie) because of the execution benefits they bring to their teammates. Search back: on the best team you ever played on, didn’t you have at least one player that was still happy and excited when you were down by 3? Mental toughness does not always have to wear a stony face and growl. Sometimes the toughest thing you can do is to visibly enjoy the moment. To pick out four quick examples: Jody Dozono and Damien Scott are some of the most difficult opponents to face. In each, there is an obvious sincerity and seriousness on their face when they play. But all can also keep their sense of humor on the field. That is downright intimidating as an opponent. It lets me know that no matter how important the moment is, they are composed and keeping their head straight. If you can be that player, then your skills will increase relative to those around you when the game is on the line. I told you that pressure was a challenge. It is also your greatest ally. Without the pressure and importance of a moment, you can’t summon the extra energy that tends to accompany great performance. The goal is not to eliminate pressure, but rather to take the good parts without taking on the bad as well. Reacting appropriately to pressure is one definition of ‘being in the zone’. If you are interested more in this, check out the linked graph (thanks to Miranda Roth for the find). One of the most interesting parts of execution is that it can go beyond situations that you could hope to prepare for. Mike Caldwell completed a ‘greatest’ in two different UPA Championship games. One while being fouled! Do you think that he spent hours at practice working on that talent? No. Not only would it have been silly in the face of limited hours of daylight in a training year, it would probably have gotten him injured. But he executes, and he can think quickly and flexibly. He can survey his (new, different, changing) environment and come up with a new combination that can help his team. This flexibility is execution in its most impressive form. If you want to get all meta and decide that this flexibility of execution is actually a talent, it would be hard to argue against you. I think of this as execution because it, like any part of execution, decides which prepared talents get to show their face to the world in the big game. Mental toughness is vital to execution. Having had the privilege of watching Tiina Booth coach at camps and teams, I’ve watched a perfect example of not only fostering mental toughness but also developing it. In Finland in 2004, the US Boys’ gold medal game was a last minute switch into a massive stadium in front of a much larger crowd. Typical of other Booth teams, the uncontrollable situation did not negatively influence their execution. For me, an even better example occurred at the 2005 YCC tournament. The New England Boys (a predominantly Amherst team featuring incredibly tough players including Darden Pitts and a young Christian Foster) were forced to sleep in what can only charitably called a hotel. The nighttime racket, disturbances, and at least possible proximity of many felonies had nothing to do with the actual fields that they were playing on the next day. Many other teams would have folded, though. They had a good excuse. Many of us will be let down by brains that allow a good excuse to write a narrative for why it is okay to play below your own standards. This team never did, and any onlooker would have assumed that they slept, ate, and traveled in complete serenity judging by their performance on the field. When situations change or are difficult, Coach Booth’s teams play much closer to their potential. Said another way: the ravages of pressure have less influence on Tiina’s players. Mental toughness can be taught, can be learned, and it is the way that your team can execute even during the chaos of a game or a tournament. You may be able to throw your backhand 60 yards while pivoting. You may also be able to recognize when this is the right throw, based on what the defense is showing you. Those are talents. If you practice in game-like situations and pour mental energy into it you will prepare yourself to do it well and consistently. But even after all of that, you will still need to execute when your mom and the tryout committee are watching. Execution is the final word in success, and players that do it well can succeed even in the face of superior talent/preparation. Talent, Preparation and Execution are the keys to winning more games. I think that these keys will help define other parts of our sport, and eventually how you should go about raising your own game. In the next few days, I’ll try to address how fitness and experience are important, as well as lay out a set of thoughts on how teams and individuals should try to improve. Feature photo of Revolver’s Martin Cochran elevating for the d against Portland Rhino at NW Regionals ’11 by Scobel Wiggins.